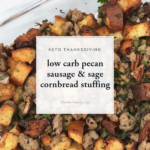 I cracked the code for tasty brown butter and sage keto cornbread, which serves as the base for this savory stuffing. 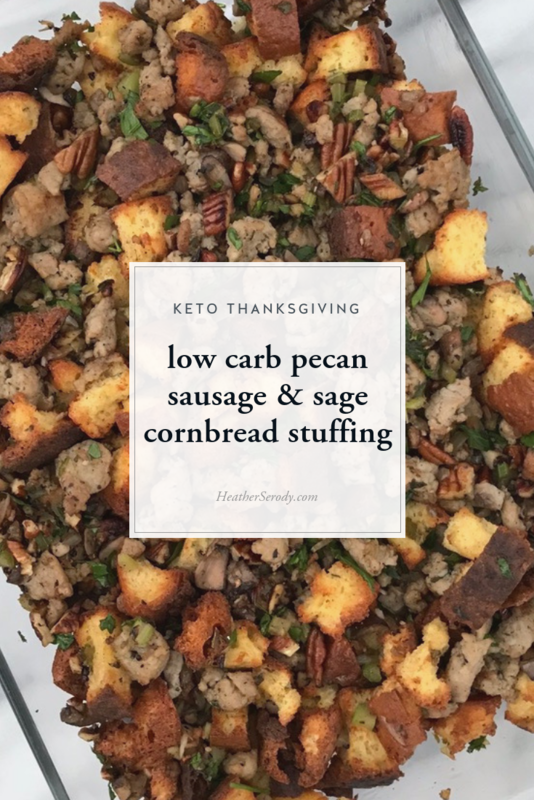 If you're not a fan of cornbread stuffing, just leave out the corn extract when making the skillet cornbread and you'll have a regular white bread loaf to cube & toast for the base of this stuffing. Isn't it nice to have options? 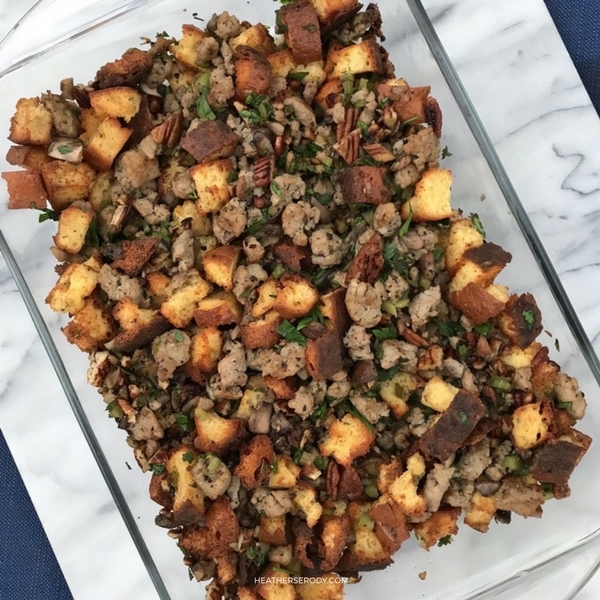 This is a stuffing that doesn't stick together much. If you prefer a sticky stuffing, add twice the egg and a bit more broth to hold it together. 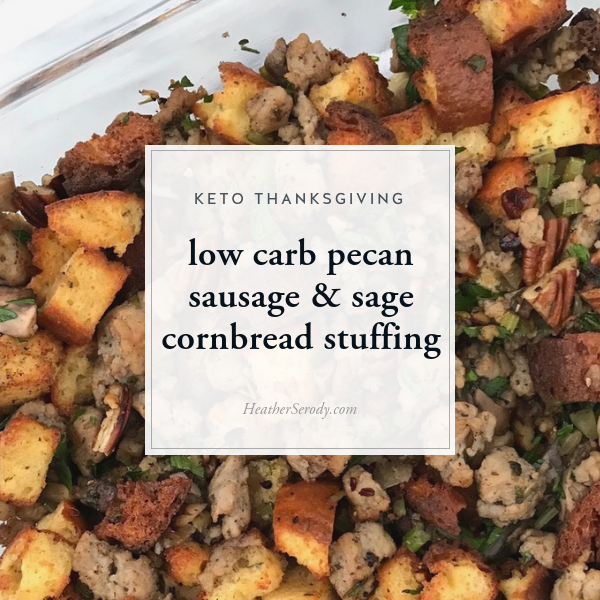 If you're not a fan of low carb stuffing, you can substitute your favorite cubed breadcrumbs just as easily, whether they are low carb or not this recipe still comes together beautifully. I know that a lot of low-carbers do make an exception for Thanksgiving, and this is a judgment-free space, so do what's right for you. 1 lb. ButcherBox grass fed sausage with sage -or- sweet Italian sausage casings removed. Grease a 9 x 12 casserole dish with the butter. Toast cornbread: Line a baking sheet with parchment paper. Spread cornbread cubes out evenly. Place cornbread in the oven to toast for approximately 10-20 minutes or until no longer soft, tips are turning brown & cubes are well toasted. Remove from oven and set aside. Put sausage meat in a 9-inch cast-iron skillet & cook over medium heat. After a minute or so, add chopped sage and cook, breaking up lumps, until meat is about halfway cooked, about 3-5 minutes. Add 1 TBS butter, onions, celery, mushrooms and garlic to the partially cooked sausage. Cook, stirring until softened and the sausage is cooked through - about 5 more minutes. In a small bowl, combine broth and the egg & whisk to combine. In a large bowl, add cornbread, cooked sausage mixture, pecans, salt, pepper, & parsley. Mix together with a big spoon until combined. Pour into the greased casserole dish. Pour the broth/egg mixture over the stuffing until it is just dampened, but not swimming in egg/broth mixture. Cover with foil and bake for approximately 20 minutes, until heated through & set. Uncover stuffing and cook for additional 5-15 minutes or until the stuffing is golden brown on top.